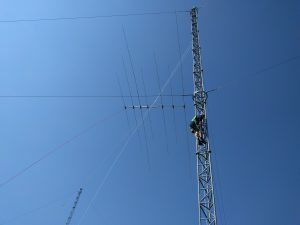 First yagi in one of the new towers. 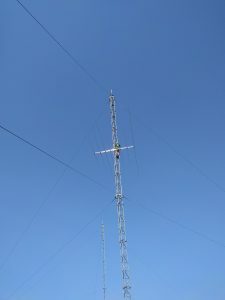 Today Thomas PA1M was here to help with lifting the first antenna in one of the towers. It is a 7 element Optibeam. 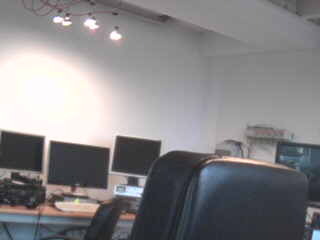 It is one of the smaller antennas. This one will be stacked with the C31XR from Force 12. The Force 12 Yagi will go to the top of the tower. We lifted the yagi with a tramline. Something we never did. So it was also a practice to see how this is working out. Antenna lifted with a tramline to the tower. 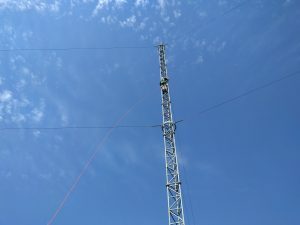 Connecting antenna to the tower. YouTube video adding one of three new towers Turned the south west rotary tower for the first time.